Jan Hus, or John Huss (c.1370 - 6 July 1415) was born in Husinec, Bohemia (now Czech Republic). He was a Bohemian religious thinker and reformer. He started a religious movement that was strongly influenced by the beliefs of British scholar, John Wycliffe. Hus studied at the University of Prague. In about 1400, he became a Catholic priest, and was soon accepted a position of preaching in Czech, the language spoken in Bohemia. While preaching, he studied Wycliffe’s writings, and came to like them, especially because of how authentic and real they were. In 1403, Hus asked the church to undo the ban on Wycliffe's writings, and translated them into Czech. The church, led by archbishop Zbynek Zajíc, had different beliefs. 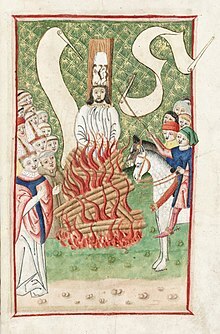 In 1410, Zajíc ordered that Hus’ writings be burned and Hus and his followers, the Hussites be forced out of the church. Hus was excommunicated in 1411, condemned by the Council of Constance, and burned at the stake on 6 July 1415, in Konstanz, Germany. When Hus was killed his followers revolted and fought against the Catholics until they were defeated in 1431. The (Catholic) Church is made of all those meant to be saved (ecclesia est universitas praedestinatorum). It is not made of the hierarchy of priests. Christ is the head of the Church, not the Pope. It is therefore not necessary to obey the pope to be saved. Many of his teachings were later taken up by Martin Luther. ↑ Haber, Katharine. 2013. Jan Hus. World history: ancient and medieval eras. ABC-CLIO. ↑ Ozment, Steven. 2013. Reformation. World Book. This page was last changed on 27 June 2018, at 16:31.